A shimmering glow is a look I go for on a daily basis. I love any product which can give me a gorgeous dewy look and I am constantly adding these products to my make-up collection! Shimmer bricks are something I have used for years and I don't feel like my face is complete without it! With my current shimmer brick coming to an end I knew it was time to invest in a new one and this was the perfect bargain price for my current budget! 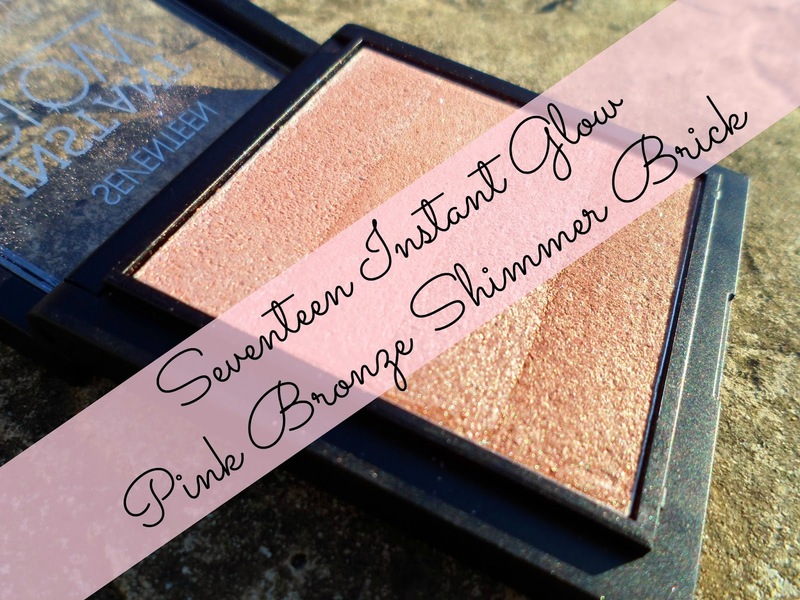 This is the Seventeen Instant Glow Pink Bronze Shimmer Brick. With my holy grail fake bake shimmer brick (mentioned in many a post) being on it's last legs I knew that it was time to hit the shops and find a replacement. Although I needed cheaper replacement - and this beaut from Seventeen fit the bill perfectly! Seventeen are a brand that since I started my blog back up again last May I have mentioned countless times! They have really upted their game and alot of their products at the moment are up there in my favourites! This shimmer brick comes in 2 fab shades - a pink shade and a bronzed shade! I've had trouble before with over bronzing myself (sometimes when intoxicated) with my shimmer brick so I thought Id try out the pink shade which hopefully would just give me a lovely pink shimmer! These are such a great range of shades which when blended together make a gorgeous shimmering glow! This is the last product I use on my face when doing my make-up - after my concealer, my foundation - everything - I pop this onto a blush brush and just add it to the apples of my cheeks and a little down my nose! I love the subtle shine it gives me for both day and night, my make-up doesn't feel complete without it! Even though this is only £4.99, half the price of my Fake Bake brick that I have been using for years and years - it works just aswell, you can hardly tell the difference apart from the fact this is has a slightly pinker tone! I love it and if it is anything like my other ones this thing is going to last for years! Really randomly my mum loves this, she has about three of the exact same one bless her. It gives a really nice glow, I might just 'borrow' one of hers haha! Such a beautiful shade. I love it! Lovely post hunn. Ooh this looks nice! Revlon do a similar one which is lovely! This looks like the Revlon Highlighter which I have been loving recently. Great review.